James Jones returned from the DL and had 3 hits in the win on Tuesday night. GENERALS RECAP: LF Leon Landry (1×4, 2 RBI) hit a 2-run single as part of a 4-run Generals 6th inning as Jackson came-from-behind to defeat Chattanooga 4-1 on Tuesday night. CF James Jones (3×4, 2B, BB) led the team with 3 hits, while RF Jabari Blash (2×4), 3B Ramon Morla (2×4, 3B, SB) and C John Hicks (2×3, R, RBI, BB) each recorded 2 of the Generals 10 hits. Starter Cam Hobson (6.0,7,1,1,1,5,HR) recorded his first AA win after recently being promoted from A High Desert, allowing only 1 run on 7 hits in 6.0 innings. LH Nick Hill (0.1,2,0,0,1,0) and RH Stephen Kohlscheen (2.2,1,0,0,1,3) combined to hold the Lookouts scoreless over the final 3.0 innings. Kohlscheen allowed only 1 hit and struck out 3 in 2.2 socreless innings to earn his 2nd save with Jackson. NEWS & NOTES: 47 of 128 games have been 1-run games (20-27) which is the T-1st in the Southern League…66 of 128 games have been decided by 2-or-fewer runs (25-41) and 17 have been extra-inning games (5-12)…In games decided by 3+ runs the Generals are 32-27. • BLASH STREAKING: OF Jabari Blash has hit safely in each of his last 10 game, batting .438 (14×32) with 5 runs scored, 2 doubles, 1 home run, 9 RBI and 14 walks. The 10-game streak is T-2nd longest this season by a General. • WALKER TO MAKE MLB DEBUT FRIDAY: 21-year-old former General RH Taijuan Walker will make his Major League debut Friday at Houston. Walker will wear #27 when he takes the mound on Friday. In 25 starts split between AA Jackson and AAA Tacoma, Walker has combined to go 9-10 with a 2.93 ERA (46 ER, 141.1 IP) and is averaging 10.19 strikeouts per 9.0 innings pitched (160 strikeouts). Walker is tied for 4th among minor league pitchers in strikeouts. Walker becomes the 4th 2013 General to make his MLB debut. • GENERALS WELL REPRESENTED IN AFL: There are 3 current Generals headed to play for the Peoria Javelinas in the prestegious Arizona Fall League. Infielder Chris Taylor and relievers Carson Smith and Dominic Leone will represent Jackson along with former Generals Danny Hultzen, Brandon Maurer, Stefen Romero and High Desert infielder Patrick Kivlehan. The squad will be managed by Jackson’s Jim Pankovits. • BLASH NAMED SL HITTER OF THE WEEK: OF Jabari Blash was named Southern League Player of the Week, for Aug. 19-25. In 9 games last week, Blash led the Southern Leauge in average (.500/12×24), on-base percentage (1.526) and walks (14). Overall he hit .500 (12×24) with 4 runs scored, 2 doubles, 2 home runs, 6 RBI, 14 walks. Blash was promoted to AA Jackson from A High Desert on Aug. 2. In 22 game, he is batting .315 (23×73) with 9 runs scored, 3 doubles, 6 home runs, 12 RBI and 18 walks. • TAYLOR’S HOT AUGUST CONTINUES: INF Chris Taylor is batting .336 (36×107) with 21 runs scored, 4 doubles, 1 triple, 7 RBI, 13 walks and 9 stolen bases in 28 games in August. • JONES RETURNS FROM THE DL: James Jones suffered a strained left triceps muscle on August 1 vs. Huntsville. In 98 games this season, Jones is batting .276 (97×351) with 13 2B, 10 3B, 6 HR, 45 RBIs and 26 stolen bases. Jones leads the Southern League with 10 triples and is 1 shy of Jackson’s franchise record for triples in a single season. Chantz Mack was sent back to Short-A Everett on Monday. 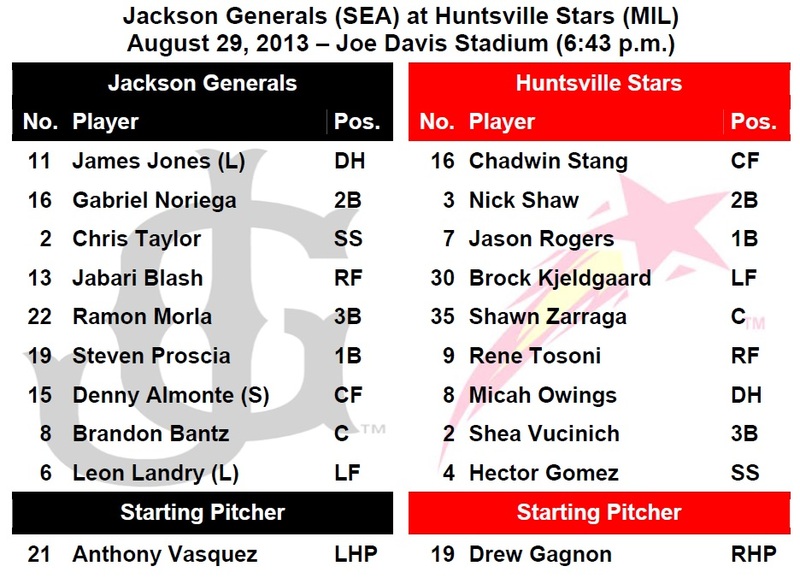 • ROSTER SHAKE UP: During the last week the Generals have lost top offensive players Ji-Man Choi (promoted to AAA) and Julio Morban (broken right fibula) while losing top starter LHP Roenis Elias (Appendectomy). Morban and Choi had combined for 140 hits, 30 doubles, 8 triples, 16 home runs and 83 RBIs. Elias had a 3.18 ERA in 22 starts and was 3rd in the SL with 121 strikeouts. • CLOSING TIME: RH Carson Smith since June 21st has made 20 relief outings going 7-for-7 in save oppertunities with a 0.34 ERA in 26.2 innings, 13 hits, 1 earned run, 40 strikeouts and 10 walks. He has allowed just 1 extra-base hit during that span. • THE RELIEVING MA-SCHEEN: RH Stephen Kohlscheen has allowed only 3 earned runs over his last 30.2 innings (0.88 ERA). During this 17-game stretch (since June 26), he is 5-0 with 1 save while lowering his season ERA from 3.60 to 2.33. 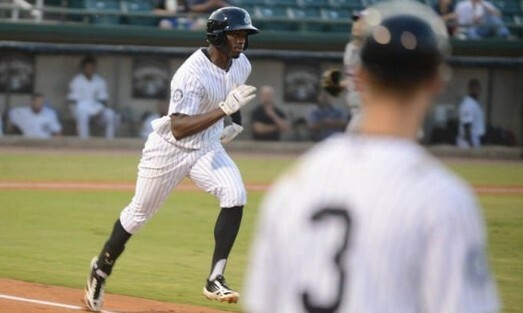 • TRIPLES ADDING UP: OF James Jones recorded his league-leading 10th triple on July 24th in Chattanooga. He is 1 triple away from tying the franchise record. Jones is tied with Richard Lewis (10, ‘04) and Chris Walker (10, ‘06). Dwaine Bacon (11, ‘04) and Bo Porter (11. ‘98) are leaders. As a team the Generals have 41 triples which is T-1st in the Southern League. • WE GOTCHA!! Jackson catchers lead the SL catching 51.6% of base stealers (65 CS, 126 Att). The next closest is Pensacola which is throwing out 34.6% of base stealers.